This video tutorial is the popular video tutorial over the internet. The instructor will walk you through step by step from the scratch and he explains how to design, code, plan, and best practices to build responsive landing pages for a company. In this video tutorial, the instructor covers what is HTML, what is the structure of the HTML? what are attributes for an element? What is CSS? and how to apply styles to the HTML element? different types of styles applied? what is the difference between an id and class, Relative vs. Absolute? Then you'll learn how to create the responsive web page using Media Queries and many more. By the end of this video tutorial, you will able to build a responsive website which is suitable for mobile, tablet and laptop friends. You don't need any prior programming experience to get started with this video tutorial. This video tutorial is best suitable for beginners, serves a refresher training for the intermediates. This video tutorial is a best entry-level course for the beginners. The instructor's teaching style is encouraging and motivates you throughout the completion of the course. The instructor provides a very detailed explanation of the content and provides good course exercises to follow through the lectures and to make grasp the HTML concepts easily. In this video tutorial, he explains the what is HTML, tags, attributes, structures of HTML, how to create hyperlinks, images, address, tables, forms, div tags. You will also learn about the Cascading style sheets(CSS), working with positions absolute, relative, fixed, blocks, styling forms and many more. This video tutorial is helpful for the complete beginners and also for the people who are looking to create their own website. In this video tutorial, the instructor focuses on explaining how things work rather than just explaining examples. The instructor has in-depth knowledge of HTML concepts and he kept his efforts to keep it as simple as possible to make students grasp the exact point. In this video tutorial, the instructor covers all the basic concepts required to learn HTML and CSS. The topics covered here are, HTML tags, attributes, working with media files, forms, tables, CSS. Creating responsive web design, you will also learn CSS3 and media queries, SASS, creating a cross-browser compatibility website. This video tutorial is best suitable for the beginners who want to master in the HTML & CSS and for the who students who want to become professionals. This video tutorial is presented by Lynda and the instructor walks you through the in-depth HTML concepts how to create links, lists, displaying images, nav, articles, div tags and how to apply the cascading style sheets. You don't need any software to get started with HTML, all you need is a text editor and web browser, Google Chrome works is better enough. 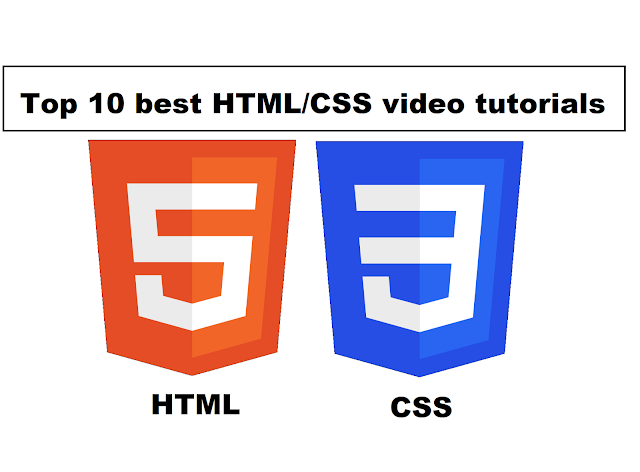 In this video tutorial, the instructor walks you basic concepts of HTML and CSS. The instructor walks you through the HTML and CSS by developing the coming soon web page. By the end of this video tutorial, you will able to learn how to create a static web page. This video tutorial is very helpful for an absolute beginner having an experience of making a simple web page using HTML and CSS. This video tutorial is the best tutorial to learn client-side web development. Here in this video tutorial, you will learn how to develop the modern responsive website with client-side web technologies such as HTML5, CSS3, JQuery, and Bootstrap. In this video tutorial, the instructor begins with setting up an environment, wireframing the website. This video tutorial is well organized and structured which helps the students to understand the concepts clearly. This video tutorial is best suitable for the beginners and intermediate skill level. Brad Traversy has in-depth knowledge of various web technologies. In this video tutorial, he will demonstrate HTML5 and CSS3 with real time projects. I bet you will learn definitely going to learn a lot from this video tutorials. This video tutorial is available online for free and few videos are intended for beginners and rest of them are best suitable for the intermediates and experts. The instructor provides the clear explanation and keeps the examples interesting for making sure that students are following him. The information provided in the video tutorial is very interesting and easy to understand. Here, the instructor covers the basic concepts of HTML, How to add Headings and Paragraph text, Adding web and email links, images, Finding icons and other graphics, working with CSS syntax, applying styles to the fonts, color and many more. If you are serious about the programming, then you must check out this video tutorial.